The self critic can be a monster for us writers and creators, but this extends to other areas of human existence as well. We’ve become quite adept at castigating ourselves for any and everything. When I wrote about negativity a few posts back, I mentioned how our attitudes toward others, how we treat other people, it’s infectious, cyclical. The same applies to how we treat ourselves. I’ve had to keep this in mind as I am about to embark on a major life change. I am in a better place now, but have still allowed the spectre of self-doubt and deprecation to creep into my consciousness. It’s an unwelcome guest that I for some silly reason invited into the home. Does that make it like a vampire? This creeping paralysis of doubt manifests itself in many forms. Sometimes it shows up as me chagrining over a typo (one that probably no one else even noticed unless they’re prone to hypercorrection). Sometimes it is thinking I am unworthy of love and happiness because I tried and failed in that before. Doubt may show up as impostor syndrome, where I wonder what I’m doing amongst such wonderful and talented people in my life. But then, we’ve all felt that way at some point, haven’t we? Even Neil Gaiman and Neil Armstrong have dealt with this. It’s also okay to accept that your opinion and views can change based on new data and new perspectives. I looked back recently at some older posts here and some things that have never been published. I had an initial cringe, but then realized it was okay for me to be wrong (or at least not totally right) or misguided because I didn’t know then what I know now. I didn’t have the perspective, the experience, the empathy I do now. My sociopolitical leanings used to be what most would consider to be more right-wing or conservative. Now I’m somewhere out past left field, not even in the stadium (if you’ll forgive the sportsball metaphor). Life teaches us lessons everyday. New people, new situations teach us. We also learn by reading. Reading is a critically underutilized tool for understanding how other people see the world. Reading social media posts hardly counts for this in many circumstances. To commit to reading a book, an article, an essay, even the newspaper can help still your mind, to focus on what the writer is trying to communicate without the distraction and pressure of likes, shares, and the bane of sanity on the internet, the comment section. Sure, there are some mistakes we can make that you can’t just take back. If you want to go to an obvious extreme, the people who ran concentration camps in World War II did more than make a mistake, they committed an atrocity. Sometimes humans make choices that so bad they can’t be undone. But those extreme examples aren’t the crux of this article, they are merely mentioned for context. I was forced to take a look back not only at how I used to view the world, but as recently as yesterday, I had to ask myself why I react the way I do to certain things. Why do I let past damages influence the present? The people who have hurt me or let me down in the past aren’t involved in my life whatsoever, and if they tried to interject themselves into my life again they would be shut down faster than Commander Data can read. So why do I let memories or failures persist? I let myself think I was a failure because I made mistakes. I tried to be romantic and loving with the wrong people. When I confronted rejection in the past (whether in love, work, or in writing) I allowed the event to consume my way of thinking. I opened the door for doubt, and once it was inside it influenced me to make decisions and look at the world through the prism of grief instead of something more realistic. This isn’t any reasonable way to operate. Myself included, we all sometimes have to shrug and say “we all make mistakes.” I broke away from my outline at the end of After Terra: Year 200, which changed the way the rest of the series has and will be written. Some might say that was foolish. 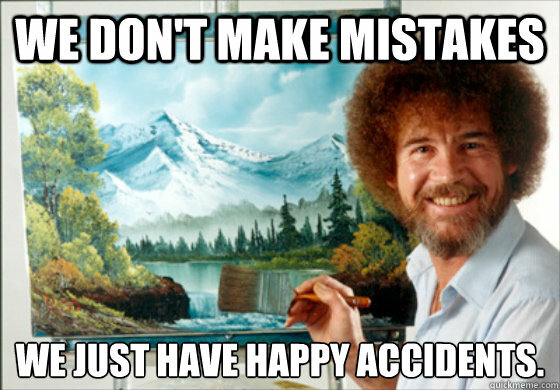 Instead, it was a happy accident, something that Bob Ross would turn into a beautiful tree. And that’s what most mistakes really are: opportunities to grow and make something better. Even though I should have been with my current partner all my life and wish I could change that, the mistakes that led me to this point allow me to appreciate what I have all the more. If I hadn’t allowed myself to be a little silly with my initial forays into blogging (through here and The Uncommon Geek), I wouldn’t have found my voice, and wouldn’t be writing this post today. If I hadn’t been willing to confront the topics of sexuality and the way the genders interact, even if I had to look a little daft in the process, I would still be stuck in the dinosaur mentality about there being some elaborate movement to undermine masculinity in modern culture (there is a movement against toxic masculinity, and there are of course real man-haters on the extreme fringe, but this is beyond the scope of today’s article). It took time and perspective to realize I was still hanging onto a persecution complex from my youth that had morphed into a different version (this coming from the idea that somehow Christians, heterosexuals, men, and Republicans are persecuted as though they are minorities… yes, unfortunately this is the kind of thinking I was exposed to as a kid). So hey, if someone wants to judge you for turning that mistake on the canvas of your life into a happy accident, into a tree, a mountain, a bird, forget about them. Just as I need to. Embrace the people who are willing to see the beauty of who you are and what you create, instead of worrying about the mistake or the failure. You’re not going to have your typos or your missteps engraved on your tombstone (at least I hope not, what are you, a masochist to the grave?). Who we are to our core, what we do that affects someone else’s life in a meaningful way, the contributions we make to the world that only we can, this is what matters. This is what is good in life. Conan the Barbarian may disagree, but hey, I have the advantage of being real. An awesome painter, those words above are fantastic, great widsom.